Annabelle loves a good cuddle. Once she feels at ease, Annabelle likes nothing more than an extended snuggle session. She’s about three years old, well-mannered, and beautiful. She loves to be fussed over and petted on and will return the affection many times over. 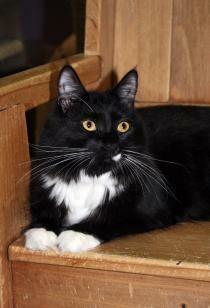 Annabelle is available for adoption through Good Mews in Marietta, GA.